This is the key finding from a new study that is the first to look at the impact of flood preparedness from multiple perspectives, including pedestrian safety, accessibility to hospitals and fire stations, and the hazards posed by travel routes and parked vehicles. Floods affect more people worldwide than any other hazard and are the main risk faced by European emergency management authorities. With projections that climate change will further increase the magnitude and frequency of extreme weather events, researchers say this makes for a pressing case for improving mitigation strategies. Previous studies have shown that most fatalities during floods occur outdoors when people attempt to drive or walk in floodwaters. Coupled with the consequences for traffic disruption, this prompted researchers from the University of Bristol, Newcastle University and the University of Florence to explore the problem by looking at multiple urban factors. University of Bristol civil engineering expert Dr. Maria Pregnolato, who conducted the study while at Newcastle University, said: "For a city threatened by flooding, it is vital to know where pedestrians and drivers could be at most danger, and when the town centre is best accessible for rescue operations." While previous studies have highlighted the need for better tools and techniques in preparing for adverse events, these latest findings represent an important step due to investigating the potential risks and mitigation with civil responders in mind. 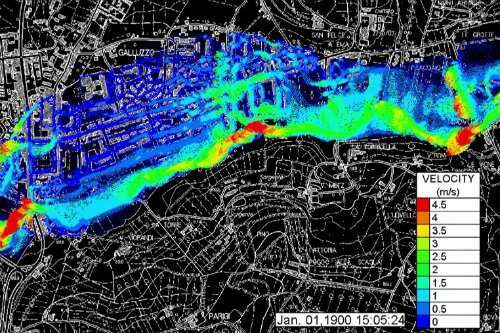 As reported in the scientific journal Science of the Total Environment, the research team modelled a scenario based on flood incident planning used by the Civil Protection Agency in Florence to set up a full-scale exercise, which was then applied to the district of Galluzzo. They looked at the level of risks posed to the public, schools, hospitals and fire stations in the event of a flood, using high-resolution open data (terrain elevation, urban infrastructures, census data) and state the of art vulnerability functions for pedestrians, parked vehicles and travelling vehicles. Moreover, the disruption of the road network due to heavy traffic was simulated to understand the residual accessibility of crucial hotspots during the emergency phase. They found that 37 percent of people in Galluzzo lived close to roads where they would be swept away if attempting to walk in the flood, and 78 percent lived in locations where parked vehicles could be swept away. Added to that, when flooding gets worse, 22.5 percent of roads were found to be inaccessible to emergency responders, while the road infrastructures meant that all hospitals, fire and police stations would be out of reach. Co-author Richard Dawson, Professor of Earth Systems Engineering at Newcastle University, said: "The research highlights the risks to the safety of pedestrians and drivers but also how flooding can limit the ability of emergency services to respond. To ensure our blue light services can quickly respond in an emergency and continue serving the public, we need to manage the flood risk on key access routes to hospitals and fire stations but also throughout the regions they serve." Researchers also found that the emergency planning in the city of Galuzzo relies on flood maps issued by river basic districts, which does not include flood depths or flow velocity – two factors that would be key determinants of flood risk and so ought to inform prevention plans. Dr. Pregnolato added: "Collaborating with colleagues from different disciplines and applying our research within a non-UK urban environment was key to helping us make progress in our understanding of flood preparedness. "For anyone working in flood risk analysis, whether from a research angle or emergency planning, our holistic methodology, and the results could be a much more effective approach. Certainly, in Florence, the municipality now has knowledge that could be used to adjust its emergency plans, as well as academic partners who the authorities count on for drawing new plans."